Natural Variation - Autism Blog: CDDS Q2 2006: What Will David Kirby Do? I think what's going on in California is a relentless medicalization of children which can expand endlessly, just as Timimi argues. I've heard of goal post moving wrt both time and element (Al as opposed to Hg). Can't we all just move the goalpost to the island of Sodor since autism is Thomas the Tank Engine's fault? Sir Topham Hat nods in approval. Thanks for the timely update Joseph. Some speculation... It's possible there has been a rebound in caseload growth following the law change in 2003 that was crafted to depress autism caseload growth. California might want to think about a new law change. I'm aware this results in children losing their eligibility, but I think they might have an unsustainable situation on their hands if these numbers continue to grow like this. Caseload in Central Valley (Fresno) is growing at an annual rate of 23.54%. I believe this is close to the state-wide peak back in the late 1990s. Caseload in Westside (West LA) is growing at an annual rate of 8.17%. This is a noticeable drop from 8.70% just one quarter back. Hmm, not sure if 31 to 39 is statistically significant. Maybe if we look at more quarters. I doubt that this is significant. I was just playing with the numbers a bit this afternoon and realized that the overall increase since last quarter was 2.7%, but over 5% in the 3 to 5 year old lot and 26% in the under 3 year olds. There have been higher numbers in this bin in the past (like September 03 with 61). "I'm aware this results in children losing their eligibility, but I think they might have an unsustainable situation on their hands if these numbers continue to grow like this." I don't think there is any reason to think the numbers will continue to grow like this. I also don't think we'll see caseload changes like this much longer, that don't also reflect population trends. Even if true prevalence among <5 year-olds were 1/150, that's probably about 16,000 or so kids in the whole state. Factor in that diagnoses aren't typcial until 18-24 months or later and that not all might be enrolled in CDDS or even diagnosed, the number of total hypothetical caseloads is probably closer to 8,000-10,000. Don't you think slowed growth is probably on the way pretty soon? That appeared to be the case previously. The current trend, assuming it continues, looks like something to worry about. It could even bring about brand new claims of a "tsunami" of autism and brand new quackery. The resources of the state of California are not my concern, but the psychiatry profession should recognize that Timimi is right in his evaluation. Well, obviously it's the aluminum. But the recent paper by Dr. Hertz-Picciotto explaining what she's doing with the CHARGE study points out that they had an usual representation of older mothers with higher education and also an unusual overrepresentation of non single births (twins, triplets). So obviously, it's the reproductive tecnhologies or possibly terbutaline if the moms were having problems carrying multiples and were in danger of having a premature birth. Interestingly, Sally Bernard seems to be an older educated mom and her autistic son was one of triplets. But those were just some thumbnail sketches of who was in the CHARGE study, they will be looking at hair samples and blood and urine samples from the kids and moms (urine only from the kids, I think) and they asked the parents what kind of pesticides they used during the pregnancy, and looked for flame retardant treated materials, I guess... they are also using a database on various big exposures that communities might have had from larger pesticide usage (I imagine it would be crop spraying, lawn treatments, that sort of thing). Dr. Amaral is needing preschoolers from the CHARGE study for his APP study, Californai isn't let him down. All of the participants in the CHARGE study, or most all are taken from clients of the regional centers. I think Kirby's going to get out of autism, if he isn't already out. That's my prediction. He won't be making any explanations, he'll be gone on to something else. The 3-5 population of California was 1,490,499 in 2004. This gives a 3-5 prevalence of at least 40.8 in 10,000. - This is the highest prevalence in the cohort, ever, in California. - Not all autistic children are registered with the CDDS in California. - This prevalence is a bit high compared to older studies that gave a prevalence of 20 in 10,000 for DSM-IV autistic disorder. But it's consistent with some newer studies. It's also consistent with the Brick Township study. - It's not clear to me that the "autism" category in the CDDS report refers to DSM-IV autistic disorder. - The "autism" category in the CDDS is not necessarily a primary diagnosis. For example, someone with Down's Syndrome and autistic would be counted. Dr. H-P's paper... I think it's free, though on pubmed when you search the free ones are supposed to have a green stripe on the journal icon next to the entry, this one didn't have a green stripe. The paper is called. I look at the data and I see growth rate having to level off to reflect population trends within something more like 5 years (assuming DSM-IV qualification is used, and that recent trends continue). Yes, I know those are big assumptions, but how did you come up with more than 10 years? I could see it easily being ten years if the current trend changed. It's a guesstimate by looking at graphs. For example, see this one by Ginger. But if you plug the 2006 numbers there, it's not that clear that we're in the downward growth trend yet. We could be starting a new upward growth trend, though it's early to say that. "Note that what David Kirby is expecting to see is a drop in the total number of 3-5 year olds. He might now claim that gradual drops in caseload growth are significant (without explaining why) but clearly that's not what he agreed to." "He [Kirby] also conceded that total cases among 3-5 year olds, not changes in the rate of increase is the right measure." Thanks Kev. Kirby couldn't have made it more clear. 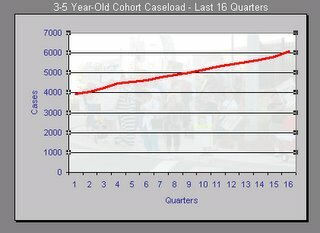 FYI - I've posted DoC's graph of the 3-5 caseload for the last 16 quarters.